Lake Namakagon, with its 3200 surface acres and 43 miles of winding shoreline, is perfect for fishing, kayaking, canoeing, sailing or water skiing. Anglers will find trophy musky, walleye, northern pike, bluegills, crappies, rock bass, perch, and largemouth and smallmouth bass. For anglers, boaters and paddlers who want to explore farther afield, there are hundreds more lakes and streams just down the road for our cabin rentals and lodge rooms. Garmisch Resort also has its own private beach and tennis court. 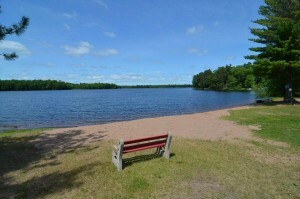 The surrounding area, including thousands of acres of Chequamegon National Forest, is a recreation paradise for hiking, hunting, bird watching, paddling, biking, skiing, ATVing and snowmobiling. The Cable area is famous for its mountain biking and cross-country ski trails, and several championship golf courses are just minutes away. During the spring through the fall seasons, guests can rent boats, motors, pontoons, kayaks, and other water toys by the partial day, day or week. Fishing licenses can be purchased at Rondeau’s store in Cable, along with bait & tackle. A gift shop is adjacent to the office with many gift items.